When Oscar Goldman murmurred these words prior to reconstructing Steve Austin he certainly wasn’t about to go for a paddle. But I was, and in searching for a title afterwards I first considered ‘As I Went Out One Morning’ (Bob Dylan), ‘Quite Early One Morning’ (Dylan Thomas), or or ‘As I Went Out One Mid-Summer Morning’ (Laurie Lee). Dylan won the Tom Paine Award for the song, which references Tom Paine, and Tom Paine had a strong link with Chichester, so it all goes round and round. The video is crudely edited – I’m still low on the learning curve – but things can only get better, as we once believed before TB cosied up to GWB. Postscript: The video originally had Dylan’s song, from the John Wesley Harding album, as a soundtrack. Due to understandable copyright restrictions, it was blocked by YouTube. I have replaced it with a free-to-play track by Lunasa, but which carries a payload of adverts. Sorry! 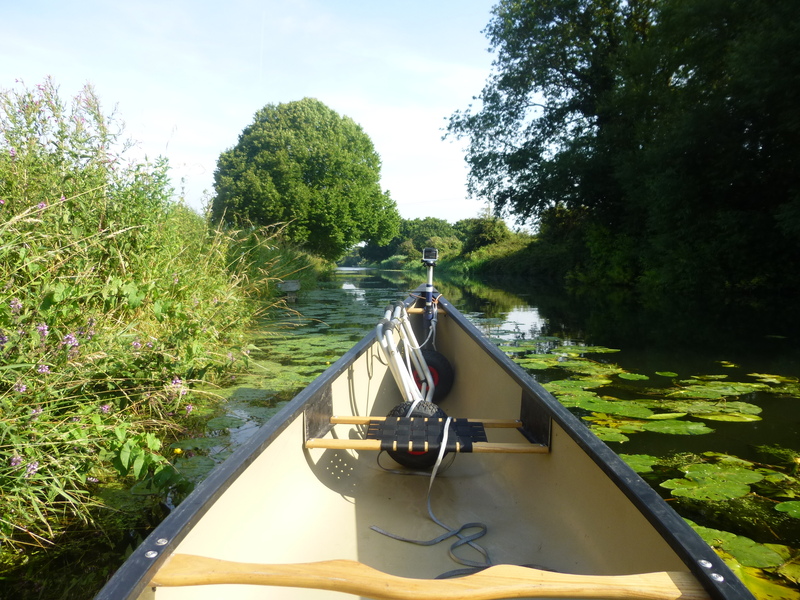 This entry was posted in canoe, Chichester, Uncategorized and tagged Bob Dylan, canoe, Chichester, Dylan Thomas, Lauri Lee, Tom Paine by Pete's Paddles. Bookmark the permalink. Thats beautiful. Excuse my ignorance….what country is this canal in? Thank you! The Chichester Canal runs from the tiny city of Chichester to join the sea in Chichester Harbour, which itself ebbs and flows into the English Channel. So to answer your question: England, south coast thereof. Oh great. Thanks. Beautiful. I hope to visit England one day….but in their summer. Not sure I could handle the winter there. Good job you didn’t come this summer – the weather has been, and still is, awful! I could almost canoe down the streams of water running down our road today. But if you do ever come, come and visit my pottery! Pretty! How far can you go from the city centre? I see that the canal is marked (disused) beyond Hunston on the OS map – does that mean unnavigable for canoes too? It’s clear for about 2 miles (Hunston, the bridge in the video, is about half way). At the B2201 nr Donnington it is possible to portage across the road but in the summer the next section is weed-choked as far as the A286 W Witterings road. The last section, down to the old lock at Birdham, is virtually impassable – reed beds and then mooring lines from the houseboats. People have battled through, but going down the Amazon might be easier, and the houseboat residents can be as hostile as undiscovered tribes. The Canal Preservation Society has a long-term and probably pious aim of making the canal navigable again all the way to sea, ie to the lock. The tow path makes a nice walk though, down to the A286. That looks great Pete – very serene! Where was the camera – on your forehead, a la Petzl? Well, I only included the serene bits, not the bits where I bashed into the wall or upset the cob. v2 appearing soon with the apposite track from John Wesley Harding, ref. Tom Paine. How many hours have I spent on this! And not my forehead, I could never be that steady. The blog’s title photo should give a clue…. You should see the bits I edited out! Look out for v2 appearing soon, c/w music (the apposite Dylan track of course).